Before applying cementitious systems, substrates must be free of dirt, laitance, form release agents, and other foreign materials. 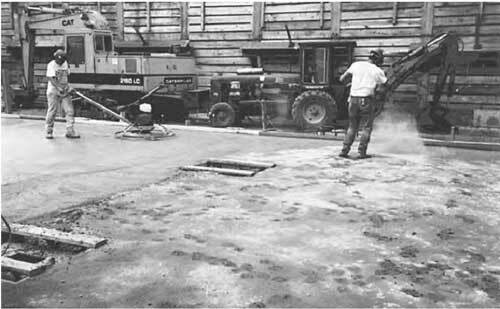 Manufacturers typically require concrete surfaces to be acid-etched, lightly sand-blasted, or bush-hammered to a depth of cut of approximately 1 16 in. This ensures adequate bonding to a substrate. All tie holes, honeycomb, and cracks must be filled by packing them with an initial application of the cementitious system. Refer to Fig. 2.37. Construction joints, wall-to-floor joints, wall-to-wall intersections, and other changes in plane should be formed or grooved with a 1-in by 1-in cutout to form a cove. This cove is then packed with cementitious material before initial application. This is a critical detail for cementitious systems, as they do not allow for structural or thermal movement. This cove prevents water infiltration at weak points in a structure where cracks typically develop. At minimum, if a cove is not formed, place a cant of material at the intersections, using a dry mix of cementitious material. Cementitious systems do not require priming of a substrate before application. However, wetting of the concrete with water is necessary. Cementitious systems are available in a wide range of packaging. They may be premixed with sand and cement in pails, or chemicals and iron may be provided in separate containers and added to the sand-and-cement mixture. Products are mixed in accordance with manufacturers’ recommendations, adding only clean water. Typically, cementitious systems are applied in two coats after the initial preparatory work is complete. First coats may be proprietary materials only. Second coats are usually the chemical or metallic materials within a cement-and-sand mixture. Third coats are applied if additional protection is necessary. They consist only of sand and cement for protecting exposed portions or adding texture. Acrylic systems often require a reinforcing mesh to be embedded into the first-coat application. Thickness of a system depends upon the sand and cement content of the coatings. The systems are applied by trowel, brush, or spray. Refer to Fig. 2.38. Certain systems are dry-broadcast over just-placed concrete floors to form a waterproofing surface integral with the concrete. 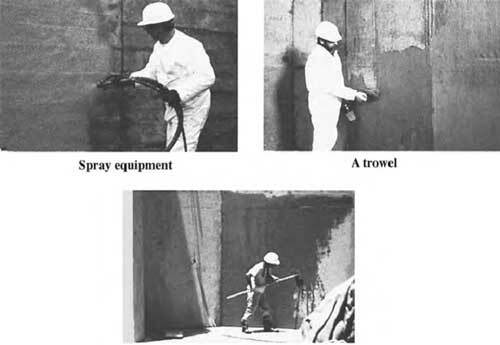 FIGURE 2.38 Spray, trowel, and brush applications of cementitious waterproofing. This method is referred to as the dry-shake application method. Broadcasting powder onto green concrete is followed by power troweling to finish the concrete and distribute the chemicals that are activated by the concrete slurry. This method should not be used for critical areas of a structure subject to water head, as it is difficult to monitor and control. Refer again to Fig. 2.36. To protect exposed floor applications, a 2-in concrete topping, carpet, tile, or other finish is applied over the membrane. Walls can be finished with a plaster coating or furred out with adhesively applied drywall or other finish systems. These systems require proper curing of the cementitious waterproof coating, usually a wet cure of 24–48 hours. Some systems may have a chemical additive to promote proper curing. These systems do not withstand thermal or structural substrate movement. Therefore they require special detailing at areas that are experiencing movement, such as wall-floor intersections. It is advantageous to install negative cementitious systems after a structure is completely built. This allows structural movement such as settling to occur before application. A typical installation for all cementitious systems is elevator and escalator pits similar to Fig. 2.39, which details the installation for this type application. Note that the system calls for two coats with no protection course and the typical cove detailing at the wall-floor intersection. This detailing would be improved by the installation of waterstop at these intersections. Some cementitious manufacturers will permit the use of their product to supplement protection of these intersections when waterstop is not used, as shown in Fig. 2.40. FIGURE 2.39 Typical cementitious cetailing for elevator pit waterproofing. In this detail, the cementitious product is installed continuously on the floor-foundation slab under the wall area intersection. Further protection could be added by installing premanufactured drainage systems on the walls and below-slab locations. While not often recommended for below-grade applications subject to hydrostatic pressure, concrete block walls are sometimes used as the wall component. The mortar joints are the weak points in this design, and cementitious systems often are not able to protect against the settlement cracking that occurs. Typically, fluid-applied membranes or sheet-good systems would be preferred; however, some cementitious manufacturers do provide detailing for this type of installation, as shown in Fig. 2.41. Note that the cementitious system is applied as a positive system in this situation, with two heavy slurry coats applied to afford the necessary protection required. Also note that a cove cant is added to the exterior side also at the wall-floor intersection in addition to the cove installation on the floor-wall negative application. Since waterstop is not applicable for the concrete block, the manufacturer prescribes a detail coat of the material on the foundation before block is laid. A drainage system is installed for additional protection, as should a vertical drainage system. Again, such a detail should be used with caution because of the mortar joint weakness. 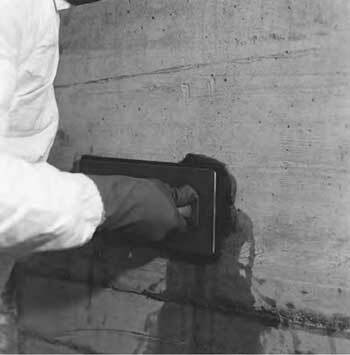 Figure 2.42 details a manufacturer’s alternative installation suggestion using the cementitious system in both interior and exterior waterproofing applications to ensure watertightness under a “belt and suspenders” system. FIGURE 2.41 Application of detail for cementitious waterproofing over concrete block. Cementitious systems are ideal for many below-grade civil structures that are typically concrete structures. Figure 2.43 provides a manufacturer’s cementitious system for an underground vault. Note in this detail how the cementitious system is used as a negative system on the slab-on-grade portion, then transitions to a positive system on the walls and ceiling structure. FIGURE 2.43 Civil structure cementitious waterproofing detailing. This transfer from negative to positive is accomplished by applying the cementitious system continuously along the slab including the area beneath the exterior walls. Cove details packed with the manufacturer’s materials occur at the floor-wall juncture. A cove is also used for additional protection at the construction joint in the wall. It would be recommended that waterstop be used at the wall floor juncture and the construction joint for the most complete envelope protection. Figures 2.44 and 2.45 present typical detailing for cementitious systems on two other civil projects, a sewage treatment digester and a swimming pool structure. Similar detailing of cementitious systems can be easily transferred to other concrete structures below-grade. Again, combining the proper use of waterstop, cove installations at structure weak points (note the cove installation recommendations at pipe and other similar penetrations in Fig. 2.46), and cementitious applications in accordance with manufacturer’s instructions will result in watertight below-grade concrete structures. FIGURE 2.44 Civil structure cementitious waterproofing detailing. FIGURE 2.45 Civil structure cementitious waterproofing detailing.